One of the first baked good recipes that I created is this gluten free and dairy free Vanilla Cake. It is the perfect gluten free birthday cake recipe! When it comes to vanilla cake, I don’t know where to start. Ugh. Since going gluten and dairy free I had not enjoyed vanilla cake. After trial and error of soooo many recipes I had found, and none of them working out. Then I was wasting money on every box brand I could find I could find at the store. As a result of this frustration I knew I needed to take matters into my own hands. 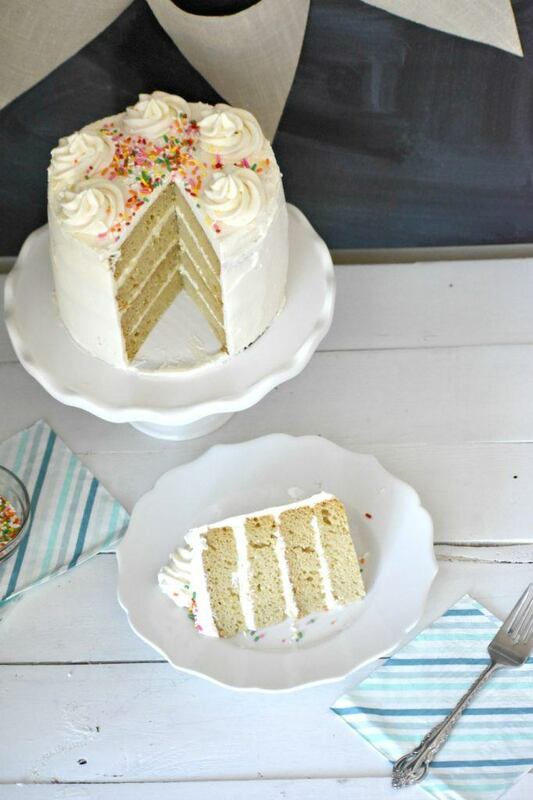 This Gluten Free and Dairy Free Vanilla Cake is going to rock your world! First of all, nothing is more disappointing than all of your hard work and you end up with a brick. Chocolate never did me dirty, vanilla was a dirty creep. Finally, I was tired of having to settle more less than decent cake. Due to my frustration I decided to make the damn thing myself and I used the methods of how I used to make a regular glutenous cake. After I tweaked the ingredients and played around with it a bit to make it gluten and dairy free, voila! The worlds best tasting gluten free and dairy free Vanilla Cake! Finally , I had a delicious cake with perfect texture! Could it be, cake that tastes like cake? The most noteworthy part of this recipe is how well it holds up and how comparable the texture is to a regular cake. Therefore, I literally have friends and family that request this for their birthdays when they could easily get a normal cake at a bakery. As a result of this cakes popularity, this recipe is tried and true a million times over. It has been used as the base for anything that calls for vanilla cake, especially during the holidays. It is truly the perfect gluten free birthday cake recipe. Note: It is also important to remember that your All Purpose Flour mix is a huge part of this process, since My AP Mix makes fluffy cakes and baked goods I would highly recommend using it. I have bought some pre-made mixes from the store that caused major recipe fails, so please keep that in mind. My first thought was that I had gotten over my head, could I really pull this off? Gluten free and dairy free Vanilla Cake seemed like a tall order, but let me tell you- I nailed it! My very picky Husband and Son whom are both partial to chocolate only love and request this cake often. This cake literally melted in my mouth. The fluffy sweetness as it touched my tongue and began to melt, made my senses dance. 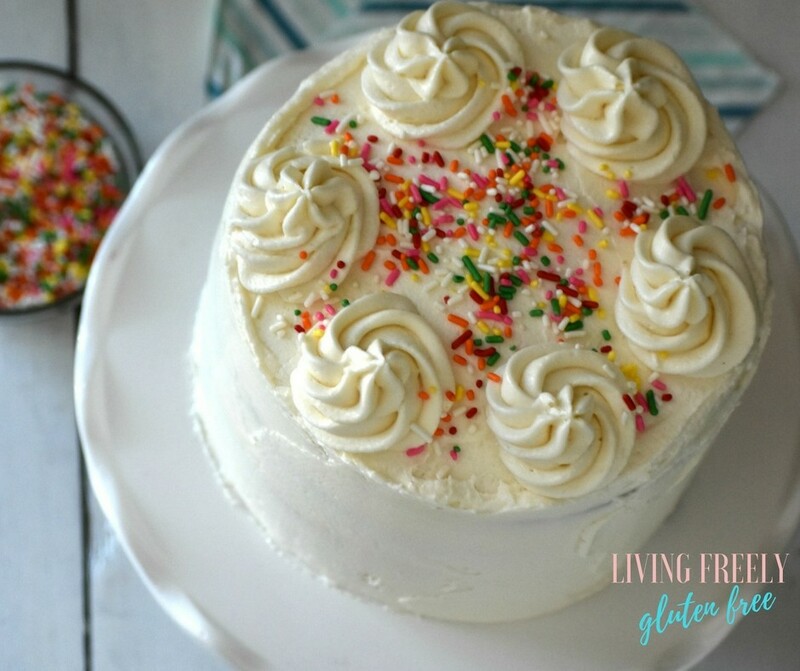 Even my non gluten free friends and family want this gluten free birthday cake every year! How do I make gluten free cake moist an fluffy? Please follow the recipe. It’s also very important to whip it up really well, therefore a stand mixer is the best way to do this. Sure, you could do things by hand, but your results might not be the same. Make sure to top it with the best ever Buttercream Frosting. 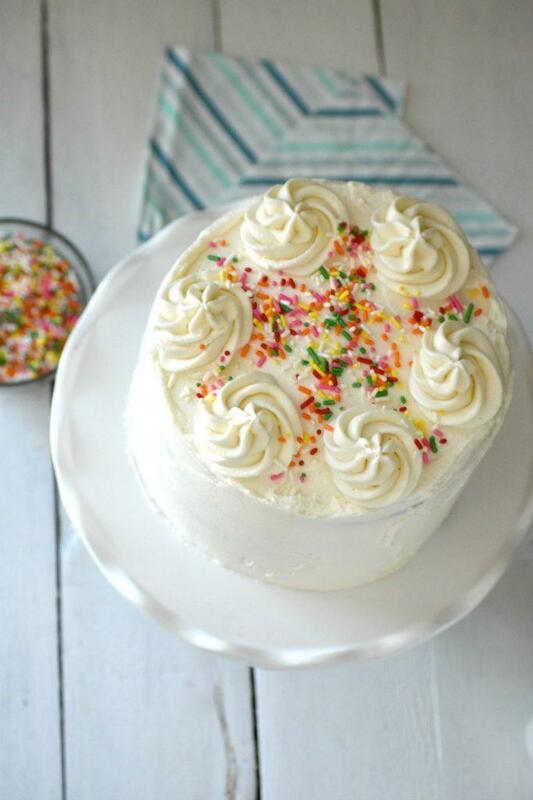 This perfect Gluten Free and Dairy Free Vanilla Cake will melt in your mouth. It is so good that no one will know that it is gluten and dairy free. Boil the water in the sauce pan with ½ cup of sugar for 3 minutes. Allow to cool. In your stand mixer blend the other ½ cup of sugar with the butter and melted coconut oil. Add the eggs, vanilla, salt, baking soda, baking powder, xanthan gum and gluten free all-purpose flour. Beat on medium for about 5 minutes until your batter is almost a pudding like consistency. Pour into your greased pans. I use coconut oil to grease the pan. Cupcakes cook 16-20 minutes. 6 inch rounds cook about 27-30 minutes and 8 inch rounds cook 30-35 minutes. Watch after 20 minutes in case your oven runs hot. Test with toothpick. Enjoy! 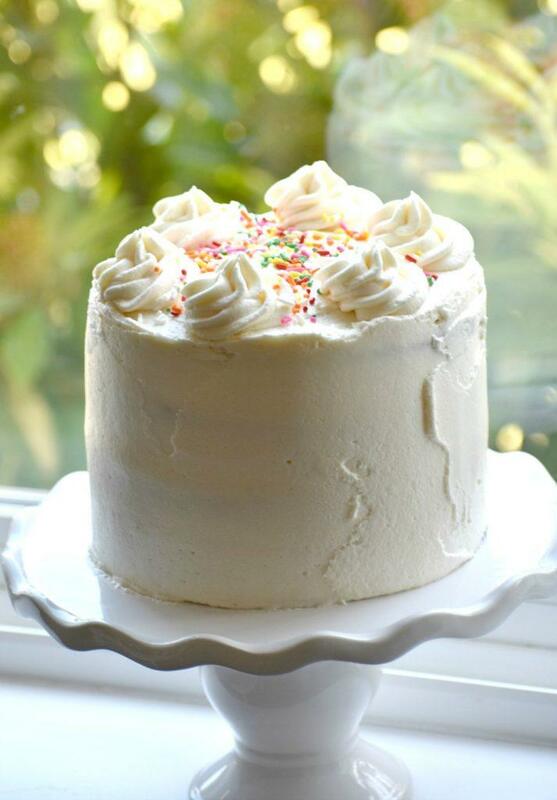 Click HERE for the Best Ever Buttercream recipe. It is vegan too! This post contains affiliate links. If you click and order through these links, my website earns a small portion. Thank you for your support. I you like this recipe then you will love my cookbook, because it contains this recipe plus over 100 more. 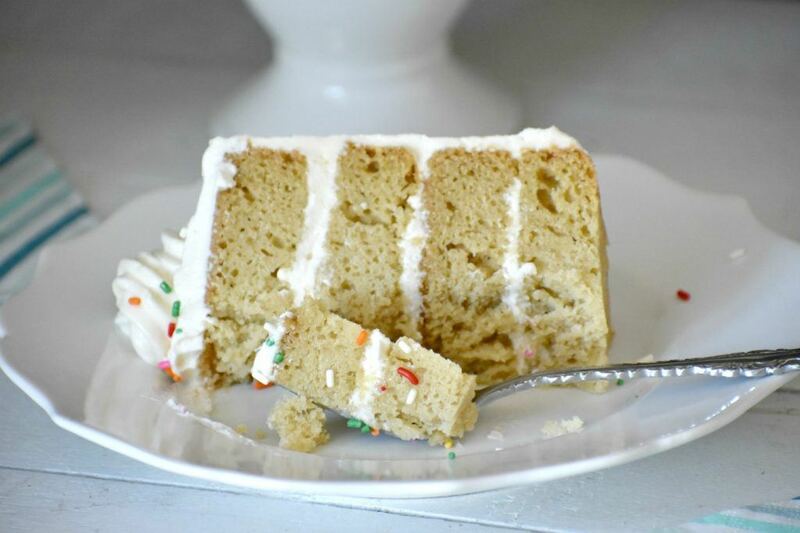 Do you love this Gluten Free and Dairy Free Vanilla Cake recipe? Please leave a rating below! 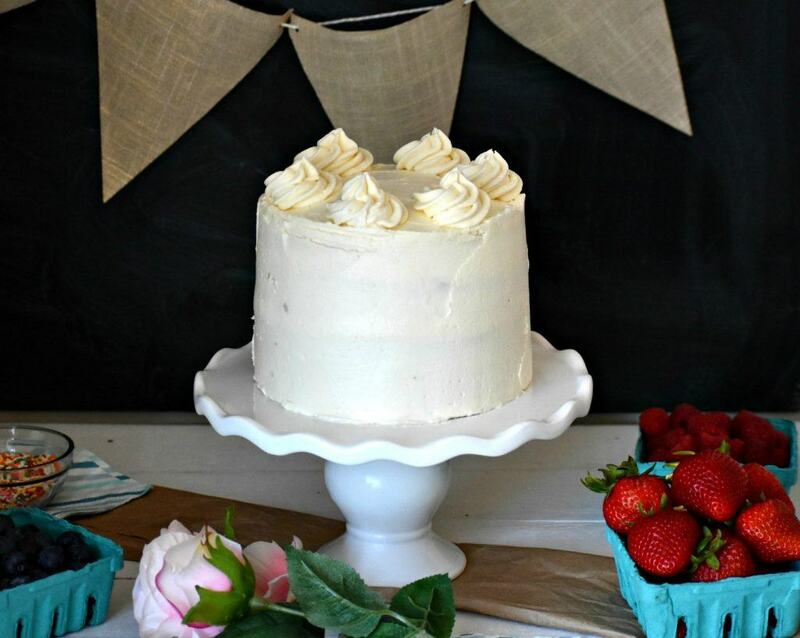 Want more recipes like this Gluten Free and Dairy Free Vanilla Cake? That cake is amazing. My cakes never look that pretty. hahaha And, I understand your frustration when it comes to finding cook stuff to eat for us Gluten Free People. Thanks Susie! We love this cake too. I make it all the time! Well, I think it’s weird that I can your replies, but not people’ comments! Of course, it wouldn’t have done me any good, since I made the batter before I thought to read them. Anyway, the batter looks excellent and tastes nice. The cupcakes are in the oven, and I guess I can post again in about 12 minutes. Are comments not showing up? It could be that this recipe is one of my first, and since created it I have changed hosts and platforms. Anyways, please always reach out to me with questions. You can follow me on Facebook and Instagram and I check my messages frequently. Well, the cupcakes are out of the oven, and they are 22 absolutely beautiful, cupcakes. They all have perfectly domed tops, which is what I like when I make cupcakes! They tested done by touch, and then with a small, sharp knife (couldn’t fine my toothpick holder) at exactly 20 minutes. The second pan I put in 3 1/2 minutes after the 1st pan, but they all tested done at the same time. However, after cutting open and eating one from the 2nd pan, they should have stayed in that extra few minutes. Still amazing, but the tiniest bit not so perfect. A tiny bit too moist, which in GF baking can translate to gumminess. My fault entirely. There are two things I would do next time: increase the salt, which would intensify the flavor, and use a better vanilla than I used. I don’t care for this vanilla I bought, which is too floral for me. A really good vanilla would really shine in this recipe! Oh, and I used Parrot brand coconut milk, which I got at Sam’s Club, and for the flour, I used Mama’s Almond Blend all purpose flour. For cakes, I think it is the best. If you can have almond. NO ONE is going to know that these cupcakes are gluten free. They are substantial, yet fluffy and melt-in-your-mouth all at the same time. For my granddaughters birthdays, I have been trying recipes that are called, “The best GF DF cake in the entire universe!” blah, blah, blah. I have to admit, some of them have been good, but I really do think this is the best one. Delicious! Now I am going to subscribe to your website! Thanks so much. Nothing makes me happier than waking up to comments like this! I am so glad that you are happy with the cupcakes. I will try the salt and I am also going to attempt this recipe with my grain free all purpose flour blend recipe that is almond and coconut flour based. I want to give these a try with a scraped vanilla bean one of these days. I bet that would really intensify the flavor. Thank you for trusting me and giving my recipe a try. I hope you will try some more soon. Have a wonderful day. This cake looks delish! I will definitely try it out but I was just wondering what you use for your AP gluten-free flour mix? Your own mixture or a prepackaged brand? I use my own blend. It is simple and inexpensive. How do you think this would do as a tiered wedding cake? After reading the reviews for several recipes, yours appears to be the winner! I have had professional bakers use this for birthday’s and weddings. If you use it for a tiered wedding cake would you please send me pictures that I can share? How exciting! I used this recipe for a tierbof a wedding cake. Easy recipe for a beginner gluten and dairy free baker. The cake turned out great! The frosting tasted amazing. I did have a little bit of a problem with the frosting sliding down, but I expected that as I had to transport an hour in 95 degree heat. I took extra frosting with me and touched it up which was easy since it doesn’t form a crust. I will definitely keep this recipe on hand as I am getting more and more “special diet” requests. Thank you so much! Hi, I have two questons can this be made without eggs? and can it be baked in a 9*13 pan? You can make this with egg replacer, but your outcome could be slightly different. You can bake in any size pan, but you will likely need to adjust the cooking time. This recipe is a keeper! Have tried so many gluten free recipes, but nothing has worked, until I stumbled upon this. Made a lovely frozen themed 2 tier birthday cake. Thank you for this! I’m not dairy free, if I make this exact recipe but use regular butter and milk is that fine? Or would I need to adjust anything? You can use the exact same measurements of butter and milk. Thanks! Hi there! 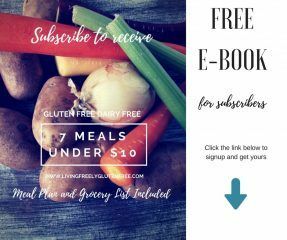 This recipe looks like the best gluten free dairy free option out there and I am so excited to make it for a family birthday with dairy free and gluten free family members! I was curious how long it can be made ahead and how to store it? Covered at room temperature… fridge? Or does it need to be eaten the same day? Thanks so much! I like to make this the day before. I refrigerate it, but then take it out a few hours before serving. You can make it up to 2 days ahead. What dairy free butter do you use? It doesn’t appear that Earth’s Best has one any more. Can you just use spectrum organic shortening, or would Earth Balance Vegan Butter be better, or do you prefer something else? Thanks! I would use the earth balance vegan butter, or any dairy free butter. Too much shortening will give it a strange flavor. Thanks! And then, what size pans are you using, and how many? 2 9″? I use 2 8 inch rounds. how many 6 inch rounds would this make? It will make 2 6 inch rounds, but they will be thick enough to cut lengthwise and get 4 layers. That is what I used for the cake pictured. I am excited for you to try it too! Thank you for bringing that to my attention, please only add 1/4 tsp. of salt. I will correct it now. Enjoy and please share some pictures with me when your done! Do you omit the Xantham gum if your blend already contains it? Or is the extra boost needed? I’m excited to try this recipe! What can i sub for the coconut oil? My friend is allergic. Hi, im alittle confused i thought none dairy meant no eggs? I think i can substitute applesauce but do you by chance know how much? Eggs are not considered dairy. Dairy is just products that come from mammals. If you want to substitute the eggs in the recipe I would recommend using Bobs Red Mill Egg Replacer. I’m afraid applesauce could change the texture and density of the cake. My 82 year old uncle and my son made this cake and it was delicious!! This recipe is a keeper and we’re getting ready to make it again for a 50th birthday party. Thank you for your diligence on tweaking your efforts. You nailed it! This is my absolute favorite gf df cake recipe! That being said, I normally make it the day of… does it make a difference if I make night before and the cupcakes sit overnight? Should I refrigerate? Hi Nicole! I am so happy tp hear that you love the recipe. You can absolutely make the night before and I like to keep them out when I make them the night before. If its any longer than one night, or if its really warm n your house then I would suggest refrigerating. Have a great day! Hi! Did you end up trying this with the paleo blend? I was thinking of trying that route but I wanted to see if you or anyone had done it yet? I’m on a cleanse at the moment and can’t really taste test , but I have an order coming to id like to use this for! My last grain free Vanilla cake had aftertastes of the coconut flour in them, and that’s not what I was going for ! I have not had the chance to make it with the paleo blend yet. I can tell you this blend definitely does not have a coconut after taste. Please let me know if you give it a try. I’m not sure if I did something wrong, but would there be a reason as to why my batter is coming out runny? Are there any ingredients that you subbed for other things? I have never had the batter come out runny. It is usually a pudding consistency. Did you still bake it? Please let me know how it turns out. It might be a bit dense. What kind of dairy free milk is best to use? I prefer coconut milk, but almond milk works great too.